RORATE CÆLI: Fontgombault Sermon for the Feast of SAINT BENEDICT: "May the Singing of the Earth keep ascending towards Heaven!" Fontgombault Sermon for the Feast of SAINT BENEDICT: "May the Singing of the Earth keep ascending towards Heaven!" What will therefore our share be? The very human question St. Peter asks the Lord is quite welcome, and it should reassure us. Peter had not waited to put this question to himself, on the day when, egged on by his brother Andrew, he had followed a man on the shore of the Tiberias Sea who was presented to him as the Messiah. Every day, either very early in the morning, or in the evening, Peter and his friends, on the shore of this lake, after a night or a day of work, asked themselves what share the housewives of Capernaum and the surrounding cities would take of the fresh fish they would be offering them. They also wondered how they would share out the profits of the fishing. What therefore would their share be? Today, Peter sees the rich young man go away with sadness. This young man was not like the Galilee fishermen, he had great wealth. And he was a righteous man, who had kept God’s commandments from his youth. Jesus Himself loved him. Yet, when the Master invited him to relinquish his wealth to follow Him… No, he really could not. That was too much. The treasure promised to him in Heaven was not worth the treasure possessed on this earth. Or rather, possessed by his own treasure, the young man was no longer able to detach himself from it so as to possess another treasure. As he remembered the day he had first met the Lord, maybe Peter was becoming aware with a certain uneasiness that he had never asked the question of the terms of the contract. They had followed, in the enthusiasm of the encounter, the Savior promised to Israel. Since then, the outlook had kept darkening. The future was growing more and more uncertain… It was becoming urgent to specify: What will therefore our share be? Peter was not asking for the impossible. As a fisherman, he was merely demanding that which was just. The Lord’s answer is unexpected: “A hundredfold, and as your inheritance, eternal life.” That was far more than what he could expect, far more than he had ever received. The share prepared by God for His friends is a plentiful share. But so as to be able to possess this share, one has to be free: not to possess other treasures, not to be possessed by them. The question asked by Peter, and the answer given by Jesus, are a light on our own path. We have once met Jesus, perhaps since the very first days of our lives, when we received the sacrament of baptism. We did not ask any questions on what would be the just reward which would be due to us. Other people thought that following Christ was something good for us. As the years pass, we have to acknowledge that between the rich young man going away from Jesus and Peter, who is convinced to have left everything to follow Him, we never really choose. Maybe our own treasure does not consist in gold and jewels, in huge expanses of land; our own treasure might be a self-esteem that never was evangelized, a secret pride; our own treasure is also such or such character trait, a bad habit that we have never really accepted to give up. No matter what it may be, we are possessed, and we are unable to possess. The Church invites us today, through the figure of St. Benedict, to choose the path of an uncompromising holiness: to forsake our own treasures, so as to receive in return the hundredfold promised by Jesus, and as our inheritance, eternal life. If the Church applies to St. Benedict the reading from the Book of Ecclesiasticus we have just heard, it is because it bears witness to the fruitfulness of the offering of one’s life. Already before his life of retreat, Benedict did not leave indifferent those who came in contact with him, as testified for instance by the miracle of the sieve broken and made whole. This shining forth led Benedict towards retreat, so as to consecrate himself to God alone. But even under the bushel, the lamp kept shining. Benedict became the Father of Western monasticism, and also the Father of Europe. After Benedict’s death, Europe was to become covered by thousands of monasteries and priories. During unsettled times, they appeared to many as places of shelter, places where one could live reconciled with one’s brothers, reconciled with God, and reconciled with nature. In these schools of the Lord’s service, monks would dwell so as to serve God alone. Were the times in which Benedict was living more unsettled than the times we are living in today? One could not claim that. Yet, it is certain that in today’s monasteries Benedict’s disciples still have to give the testimony of their faithfulness to the answer they gave to the Lord on the day of their solemn consecration, that answer which is the one the rich young man should have given, “Uphold me, O Lord, according to Thy word, and I shall live.” In return, the Lord promises not that which is merely just, but a hundredfold, and as our inheritance, eternal life. This hundredfold promised to the monk is from now on already a life of fraternity inside the community; it is a peace conducive to seeking God. This hundredfold is also the grace to be able to gather to sing the praises of God in choir, or also to gather in the daily manual work. 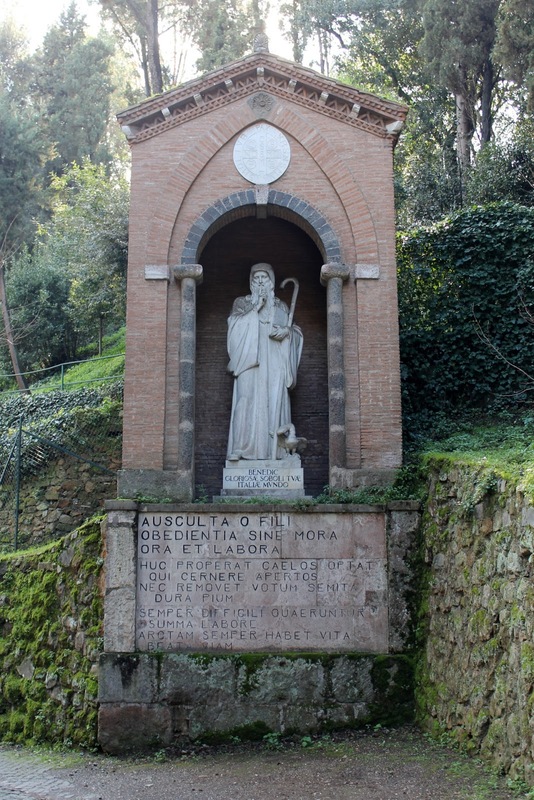 Benedict’s sole concern was to seek God, and as he did that, he became one of the main evangelizers of Europe. Today, Europe has grown old, its faith has grown cold. In the eyes of our contemporaries, the world no longer appears as the splendid work of a loving Maker, but as the fruit of a cold and soulless chance. Although telescopes may bring our eyes ever farther towards the ends of the universe, our hearts no longer know how to consider our closest friend as a being who is loved by God, or creation as a gift to be respected. The eyes of our hearts have grown dimmer, and have eventually become obscure. Amidst silence and darkness, the monastery bell should still resound, a messenger of divine Love in a world no longer able to love, a messenger of the monks, who pray for those who no longer pray. All of you who remain close to so many of these houses, please ask for these communities to persevere and for faithful vocations, so that the singing of the earth should keep ascending towards Heaven, and so that this praise should not fall silent.